Baby geese, called goslings, are so cute! Not only are goslings fun to watch, but they’re also a great way to start your own gaggle of geese. When raising geese, you can either choose to buy adult geese, adolescent geese, goslings or fertile geese eggs. Incubating your own geese eggs and hatching goslings can be a rewarding introduction to the hobby of raising geese. In this article, we’ll teach you the basics of brooding geese and hatching geese. 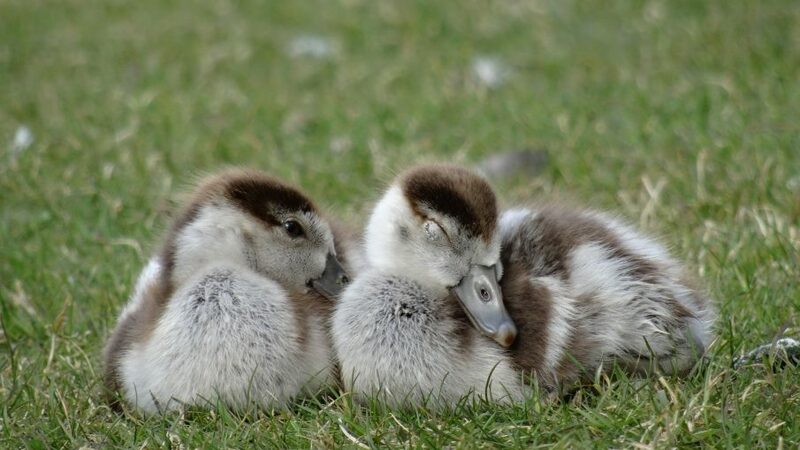 Interested in raising geese by hatching your own fertile goose eggs and brooding the goslings? Here’s how! You will need both fertile goose eggs and an incubator. A chicken egg incubator should be sufficient, though you won’t be able to fit as many incubating goose eggs into the egg incubator. Set the egg incubator to 99.5 degrees fahrenheit. The incubating temperature for fertile goose eggs is 99.5 degrees (F). Ensure the moisture levels are also at the correct humidity for hatching goose eggs (check your egg incubator’s directions!). Goose eggs take longer than chicken eggs to hatch. One the goslings have broken through the egg shells and hatched fully, leave the baby geese in the egg incubator until their dry and fluffy. Once they’re fluffy, take out the hatched geese and transfer them to your goose brooder. Unlike brooding chicks, you don’t need to setup a special gosling brooder when hatching and brooding baby geese. To brood geese, you need a well-lighted, warm enclosure. Your gosling brooder needs to have absorbent litter material for the brooding geese. We recommend 3 to 4 inches of peat moss or wood shavings. Absorbent litter for your baby geese is a must! To keep your gosling warm while hatching and brooding geese, you can use a 250-watt brooding lamp to heat the baby geese. One of those brooder lamps should be enough for up to two dozen brooding goslings. Conversely, you can use a chick brooder to brood your geese. Remember, because baby geese are larger than chicks. Thus, you can only fit about a third of the number of goslings into a chick brooder as chicks. You should also raise the chick brooder a few inches to accommodate the larger brooding goslings. When brooding your goslings, the baby geese need 6 square inches per gosling. By the time your brooding geese are two weeks of age, they’ll need at least a square foot per bird. Adjust accordingly as they grow into adult geese. How do you feed baby geese? While brooding your goslings, feed them unmedicated chick started for the first week. After that, move your baby geese to a poultry grower feed. The poultry feed you feed your goslings should be unmedicated and formulated for geese. Water should be kept before your goslings at all times after hatching. As your goslings get bigger, they won’t need a brooder and they can start to eat pasture grass like adult geese. For more information on feeding geese, see our Feeding Geese article.